and Welcome to The Yellow River Game Ranch! Stroll along a mile-long trail on 24 wooded acres and encounter over six hundred highly sociable birds and animals indigenous to the state of Georgia. White-tailed deer, bunnies, buffalo, sheep, kid goats, black bears and a bevy of new-born animals are waiting to be fed, admired and petted on a "nose-to-nose" basis. We specialize in "people-friendly" wildlife. 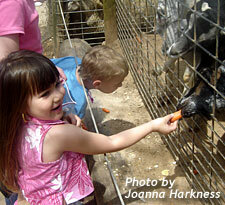 Send us your favorite photo from your Game Ranch visit! Are you trapped behind your front door by mounds and mounds of golden yellow leaves? Bag your fallen foliage and bring it to our animal preserve! The leaves provide Game Ranch animals with necessary ground cover for winter bedding and nesting. Embedded acorns provide a source of "low-carb energy" for over 100 white-tailed deer and industrious chipmunks and squirrels hording a wintertime snack. Game Ranch CEO Art Rilling said, "We encourage natural recycling-- it's an ideal opportunity to help our wildlife... and get rid of those beautiful but pesky leaves." A wooden trailer has been set up in front of the Game Ranch for convenient deposit. Located just two and one-half miles east of Stone Mountain on Highway 78, the Yellow River Game Ranch offers a magnificent photo opportunity and a chance to meet wildlife on a close and personal basis. Explore the rustic trail where newborn fawns are a delightful favorite during the summer months-- feed deer who come right up to greet you! Huge bears stand up for special treats and our overhead "catwalk" allows an extraordinary view of a very feline cougar. There's the "Billy Goat Gruff Memorial Bridge" and the super popular "Bunny Burrows." We even have one of the largest herd of buffalo east of the Mississippi, roaming in the back meadow! You'll have our animals eating out of your hand-- literally! Their favorite treats are available along the trail. Don't forget to bring your camera and video camera! 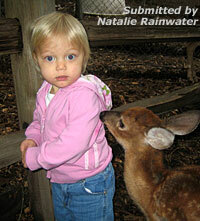 You'll capture the magical interaction between your children and our Game Ranch animals.